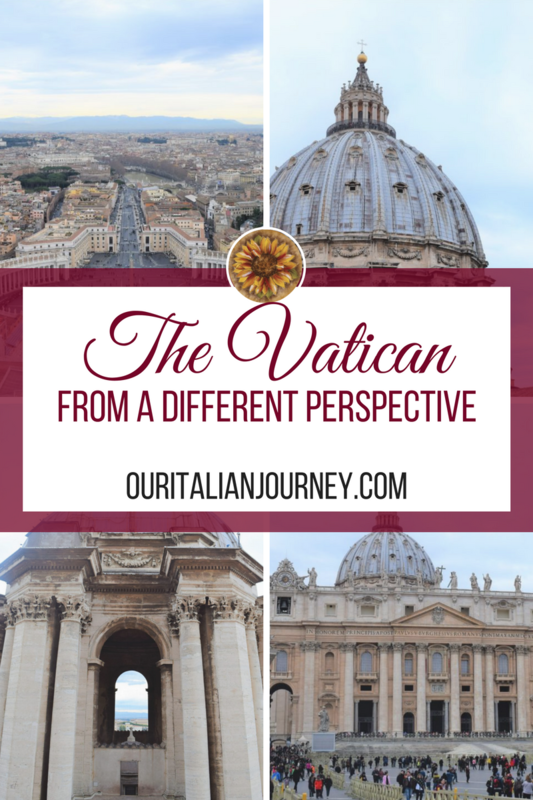 The Vatican – From A Different Perspective – ABOVE! 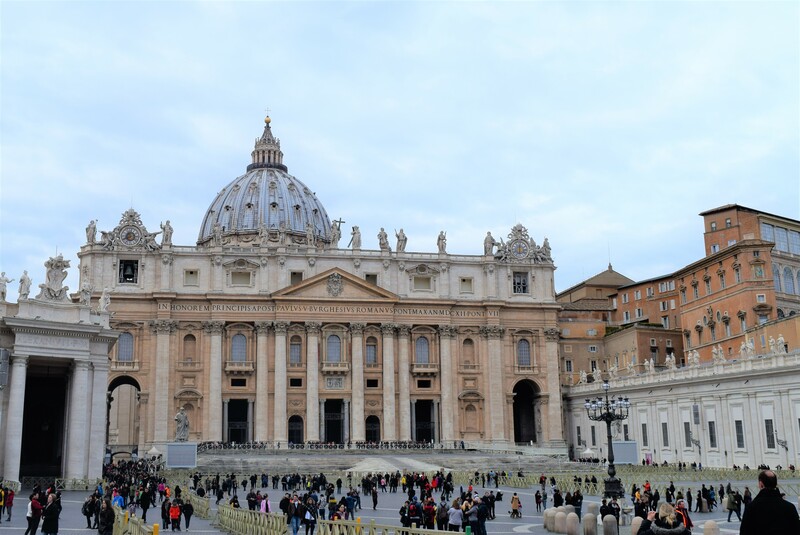 Every year visitors flock to the Vatican and miss seeing an amazing sight. 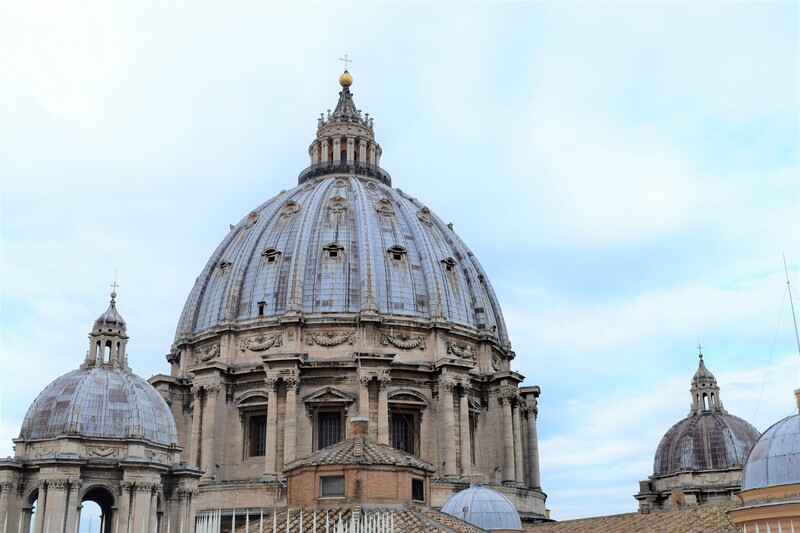 Many are not aware that it is possible to climb up to the top of St Peter’s dome; the cupola. It is an amazing experience and should be done at least once on a trip to the Vatican. 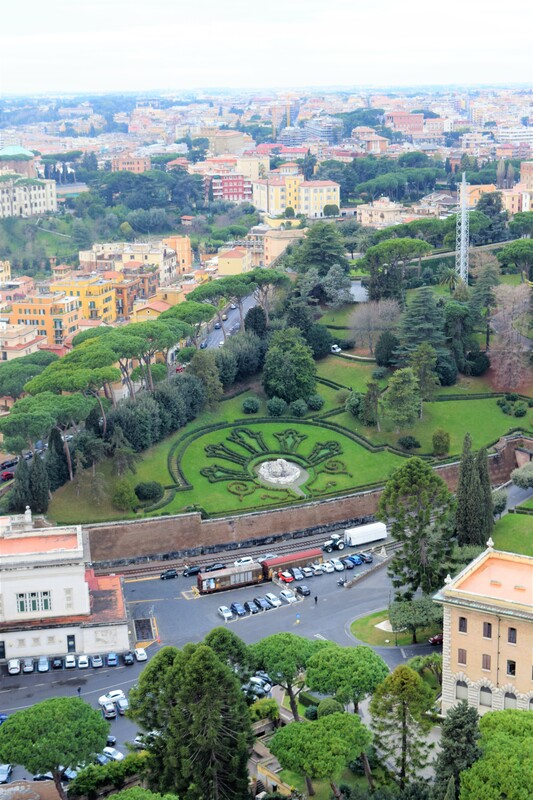 You will have a panorama view all around Rome. 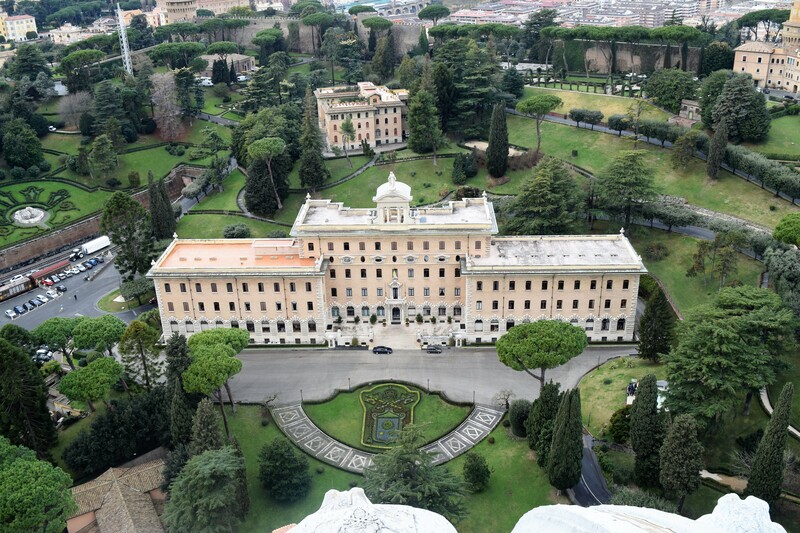 As many know, Michelangelo-designed the cupola, the iconic dome that dominates the Rome skyline. Michelangelo started this dome in 1546 at the request of Pope Paul III but was interrupted upon Michaelangelo’s death at the height of the work. Fifteen years later, Giacomo della Porta and Domenico Fontana were ordered to continue with the work. As a result, after only 22 months, the work was finished. We choose to take the elevator up instead of the 551 steps. Inside the dome, the detailed mosaics are breathtaking and you can walk around an interior balcony (which is actually the base of the dome) to view the beautiful mosaics and see the Basilica and main alter from above. 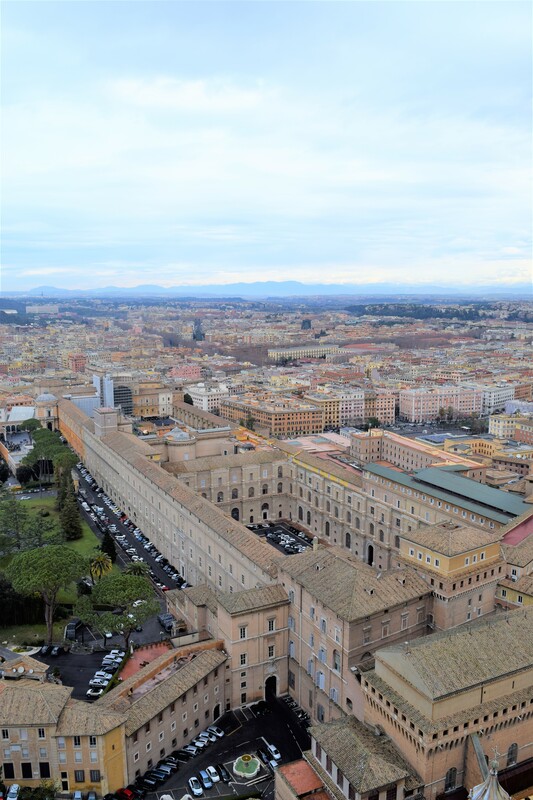 Then you can climb up even further, 300 stairs to the top of the cupola, the highest viewpoint in Rome with a span of 450 feet (150 meters) from the ground to the cross at the top. Unfortunately, you have to walk the stairs as there is no elevator to the very top. It gets quite narrow as you get further up but we took our time and were rewarded with amazing views. 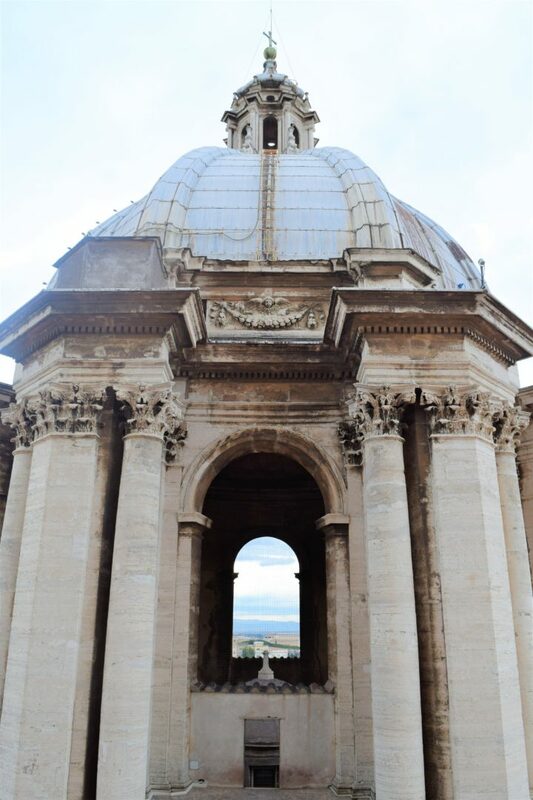 When exiting and back on the roof, you can walk to the front of the basilica to look into the Square and observe the huge statues from the facade and the cupola that is now above you. Michelangelo himself designed this dome, which measures 135m (450 ft.) above the ground at its top and stretches 42m (139 ft.) in diameter. Legend has it that in deference to the Pantheon, Michelangelo made his dome 1.5m (5 ft.) shorter across, saying “I could build one bigger, but not more beautiful, than that of the Pantheon.” Carlo Maderno later added the dome-top lantern. How exciting!! If you need any tips or suggestions, please let us know. Thank you for the comment. Really great pictures with this post! Looks stunning! Love this picture! Great shot from above!